It’s another daily giveaway thanks to Elder Road Books! 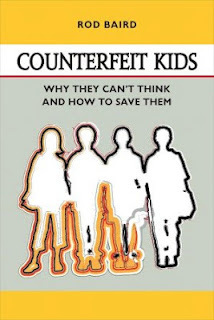 Today I bring you Counterfeit Kids: Why they can’t think and how to save them by Rod Baird! Veteran English teacher Rod Baird digs straight into the problem of teens, their parents, and their teachers. Demanding the best from his high school senior English students, Rod encounters everything from hovering parents to a school system that promotes inflated grades and quick processing over education. Reading the transcripts of his classroom discussions, one wishes that just once he had had a teacher like Mr. Baird. This eye-opening book should be required reading for every parent and every teacher. For the next 24 hours only (deadline: Saturday, June 1, 2013 at 8:00 AM EST), you can receive your very own e-copy of Counterfeit Kids: Why they can’t think and how to save them by Rod Baird. Send email to elderroad@comcast.net, subject: Counterfeit Kids Giveaway. Indicate Kindle or ePUB version. thanks for this, looks like a good one! I have 3 kids and think this book will be very useful. I appreciate the opportunity to read this. I am really excited about this book! Thanks for sharing the book. I look forward to reading it.